Everything about chili con carne generates some sort of controversy–the spelling of the name, the origin and history of the dish, the proper ingredients for a great recipe, the awesome society and cook-off rivalries, and even what the future holds for the bowl o’ red. Perhaps the fiery nature of the dish itself is responsible for such controversy, driving usually rational men and women into frenzies when their conception of the truth is challenged. Debates about the spelling are endless, and this controversy has even made it into The Congressional Record. Senator Pete Domenici (R-N.M.) noted in 1983: “New Mexicans know that ‘chili’ is that inedible mixture of watery tomato soup, dried gristle, half-cooked kidney beans, and a myriad of silly ingredients that is passed off as food in Texas and Oklahoma.” But at least Domenici allowed Texans to spell their chili with an i to differentiate it from the New Mexican versions of the dish. Texans insist on spelling both the pod and the dish with an i, which is their prerogative. New Mexicans refuse to acknowledge that the word chili even exists, which is their right, and they spell the plant, pod, and dish with an e. In Illinois, for some strange reason, the dish is spelled chilli. In the end, say the true chiliheads, it really doesn’t matter how you spell it-so long as you love it. For the past couple of decades, writers who must use these terms quite often, such as ourselves, have reached an informal agreement on style. To avoid confusing the plant and pod with the bowl o’ red, we use chile, the original Spanish-Mexican spelling, to refer to the plant and the pod. The word chili means the dish of meat and peppers. It is an abbreviated form of chili con carne, which is a curious combination of the Anglicized chili (from chile) and the Spanish carne (meat). Interestingly enough, some early California recipes were for carne con chile, which is actually a more accurate description, in Spanish, of the chili of today. Mexican caldillos and pucheros (thick soups or stews), moles (sauces made with a variety of chiles), and adobos (thick sauces) often resemble chili in both appearance and taste because they all sometimes use similar ingredients: various types of chiles combined with meat (usually beef), onions, garlic, cumin, and occasionally tomatoes. We have collected three such recipes from Mexico, Mole de Olla, Pork in Adobo Sauce, and Caldillo de Duranguense, to illustrate their fundamental similarity to chili. 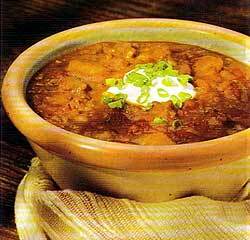 Chili as we know it today may not have originated in Mexico, but it’s there now. 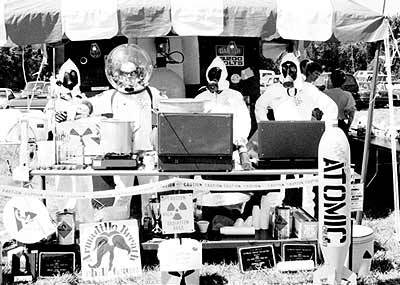 Since 1978, the Mexican National Championship Chili Cook-off has been held in various locations in that country. The Mexican cook-off is sanctioned by the International Chili Society-proving that the love of chili is indeed international. Chili con carne fanatics are not satisfied with a mundane theory holding that chili evolved from Mexican recipes. A strange tale about the possible origin of chili has appeared in several books, the first perhaps in George and Berthe Herter’s 1960 book, Bull Cook and Authentic Historical Recipes and Practices. The story of the “lady in blue” tells of Sister Mary of Agreda, a Spanish nun in the early 1600s who never left her convent in Spain but nonetheless had out-of-body experiences during which her spirit was transported across the Atlantic to preach Christianity to the Indians. After one of the return trips, her spirit wrote down the first recipe for chili con carne, which the Indians gave her: chile peppers, venison, onions, and tomatoes. Only slightly less fanciful is the theory that suggests that Canary Islanders, transplanted to San Antonio as early as 1731, used local peppers and wild onions combined with various meats to create early chili combinations. This theory, first advanced by H. Allen Smith, states that it was the Canary Islanders who first brought cumin-an essential spice in chili-to the United States. This reference may be one of the first written mentions of chili-albeit not by name. This pemmican premise even has a modern incarnation: brick chili, a highly fat-laden concoction that-because of a pound of suet-solidifies into a brick when it cools. According to another chili historian, Robert Stuart, large pots of this chili were stirred with a “chilistick,” which had absorbed the flavors and spiciness of the chili and therefore could not be used to stir any other food. A further variation on the cowboy theory holds that chili descended from “son-of-abitch stew,” a concoction made from the internal organs of a freshly killed calf or deer. Sam Pendergrast, the creator of “zen chili,” was weaned on cafe chilis. He recalled: “In Abilene, where I grew up in the 1940s, the best chili cafes were the Green Frog near Fourth and Pine, the wonderfully exotic Canton Cafe further south on Pine, the Grape Inn at Tenth and Grape, and the Dixie Pig at South 14th and Butternut. They all served the same chili–blood red, with an aroma of cominos [cumin] that could be whiffed at least a block away, hefty chunks of meat you could get your teeth into (along with bits of gristle), and a rich sauce featuring at least an eighth of an inch of grease that would easily soak up a quarter’s worth of crackers even at ’40s prices.” Sam’s slightly zen version of cafe chili is presented later in the Chili Project, along with more tales and recipes of cafe chilis. A bowl o’ red cost visitors like O. Henry and William Jennings Bryan a mere dime and was served with bread and a glass of water. O. Henry later wrote a short story about the chili stands entitled “The Enchanted Kiss.” In it, a young San Antonio drugstore clerk eats chili in the mercado and hallucinates (another out-of-body experience) that he is the former captain of the Spanish army in Mexico who has remained immortal since 1519 by eating chili con carne! The alleged hallucinogenic (beer?) and life-lengthening properties (chile?) of chili are still much debated today at chili cook-offs. Most people associate mole with the famous chocolate mole—mole poblano–but the word refers to both a mixture and a stew. No chocolate is used in this recipe, and with the exception of the potatoes and corn, this dish is quite similar to chili. Cover the anchos with water and simmer for 15 minutes until soft. Drain. In a skillet, brown the steak in the oil, remove and drain. Add the onion and garlic to the oil and saute until the onion is soft. Remove the onion and garlic; reserve the oil in the skillet. Place the anchos, chipotles, onion, garlic, and spices in a blender and puree into a smooth paste. Add the bread and 1 cup of broth and blend again. Heat the oil and fry the chile paste, stirring constantly for 5 minutes. Add the beef, potatoes, corn, and remaining broth to the chile mixture and simmer for an hour or more until the meat is tender and the potatoes are done. Add more water if necessary. Mexican adobos usually contain vinegar–an ingredient not found in very many chilis. Nevertheless, could a recipe such as this be the ancestral origin of chili? In a pot, cover the pasilla and New Mexican chiles with water and simmer for 15 minutes or until soft. Drain. Cover the pork, half the onions, and half the garlic with water. Bring to a boil, reduce the heat, cover and simmer until the meat is tender, about 1 ½ hours. Remove the pork, strain the stock, and reserve both. Discard the onions and garlic. Place the chiles, remaining onions and garlic, oregano, cumin, and vinegar in a blender and puree until you have a smooth paste. Add some of the stock if necessary. 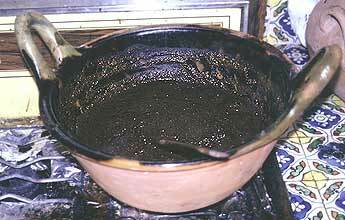 In a large saucepan, saute the chile paste in the oil, stirring constantly for 5 minutes. Thin the mixture with 1 ½ cups of the reserved stock, add the reserved pork, and simmer over low heat for 30 minutes. The sauce should be very thick. This thick and hearty stew from Durango, one of the northern states, is another Mexican dish that closely resembles chili con carne. 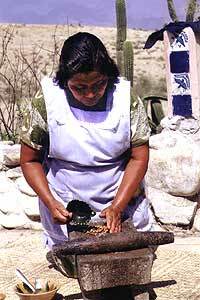 A very similar recipe, carne guisada, is given by Jim Peyton in his book, El Norte: The Cuisine of Northern Mexico. We use pork in our version, but beef (or even shredded beef) can be used. In a pan, cover the chiles with water and simmer for 15 minutes until they are soft. Puree them in a blender along with the water until smooth. In another pan, brown the pork in the oil. Add the onion and garlic and saute until soft. Add the flour and quickly brown, taking care that it does not burn. Add the chile puree and tomatoes, bring to a boil, reduce the heat, and simmer for 15 minutes. Before serving, stir in the lemon juice. According to legend, this is one of the Chili Queen’s original recipes. Some changes have been made in order to take advantage of modern ingredients. Note the heavy use of cumin and oregano. Lightly flour the beef and pork cubes. In a large pot, quickly fry the meat in the suet and pork fat, stirring often. Add the onions and garlic and saute until they are tender and limp. Remove all pieces of fat. Add the water to the mixture and simmer for 1 hour. Grind the chiles in a molcajete or blender. Add to the meat mixture. Add the remaining ingredients, cover and simmer for an additional 2 hours. Skim off any fat that rises, and serve. Cut steak in small pieces. Put in frying pan with hot drippings, cup of hot water, and rice. Cover closely and cook slowly until tender. Remove seeds and parts of veins from chile pods. Cover with second cup of boiling water and let stand until cool. Then squeeze them in the hand until the water is thick and red. If not thick enough, add a little flour. Season with salt and a little onion, if desired. Pour sauce over meat-rice mixture and serve very hot. The original version of this recipe was first published in 1880. According to John Thorne, “This may be the earliest printed recipe for chili con carne and it is surprisingly authentic, save for the suspect addition of `espagnole,’ a white sauce seasoned with ham, carrot, onion, celery, and clove.” Mrs. Owen wrote, incorrectly: “This might be called the national dish of Mexico. Literally, it means `pepper with meat,’ and when prepared to suit the taste of the average Mexican, is not misnamed.” We have revised the recipe to add ingredient amounts, which, in the recipe-writing fashion of the day, Mrs. Owen omitted. We have retained most of Mrs. Owen’s original instructions. Take the lean beef and put to cook with a little oil. When well braised, add the onions, a clove of garlic chopped fine and one tablespoon flour. Mix and cover with water or stock and two tablespoons espagnole, 1 teaspoon each of ground oregano, comino (cumin), and coriander. Take the dried whole peppers and remove the seeds, cover with water and put to boil. When thoroughly cooked (soft) pass through a fine strainer. Add sufficient puree to the stew to make it good and hot, and salt to taste. To be served with a border of Mexican beans (frijoles), well cooked in salted water and refried.